This Penguin Taster, the first chapter of Money Alchemy by Kiki Theo, is available to download for FREE! Tasters are made available in Adobe Acrobat format, so you will need Adobe Reader installed on your computer in order to view them. Download a free version of Adobe Reader here. Click on the link to download the first chapter of Kiki Theo’s Money Alchemy: Into Wealth & Beyond. Beyond the logical mind, beyond positive thinking and affirmations, beyond the known secrets of moneymaking, lies Money Alchemy. Money Alchemy is a shift in thinking; it’s a training manual that uses unconventional moneymaking tools and a personal transformation that will take readers into wealth and beyond, quickly and effortlessly. Based on the real-life wealth journey of a self-made entrepreneur who, despite severely disadvantaged circumstances, retired wealthy at 39, Money Alchemy will lift readers lightly and humorously on to their own magic wealth carpet. The results will astound! 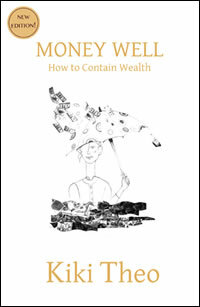 For an extraordinary moneymaking adventure journey into wealth and beyond with Money Alchemy.